Dr Yorn Try is vice-Rector of Mean Chey University in NW Cambodia. 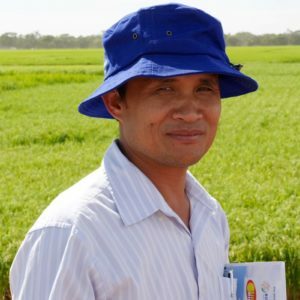 For five years he has been working with staff from Sydney University, and regional institutions in Cambodia and other SE Asian countries, to develop a network of self-help programs for practical agricultural and extension services. Try was a recipient of a Crawford Fund Training Award and made his research visit to Australia earlier this year. The purpose of his visit was to study practices for research, extension, teaching and learning in Australian agriculture, and to learn of the latest technology for rice, other crops and non-crop agriculture such as bees. Try visited a range of institutions in New South Wales including Sydney University, NSW DPI centres and nongovernmental/private-sector establishments including SunRice’s research centre and a bee farm. He also attended conferences and meetings where he made further contacts that will enable him to further his work in Cambodia, and increase his understanding of the interactions and infrastructure that sustain agrarian progress in Australia. He was able to participate actively in a round-table on public-private partnerships for sustainable intensification in rice systems in the lower Mekong, organised by ACIAR in collaboration with the Crawford Fund. Agrarian organisation and interactions in Australia. Try has become an effective counterpart for agricultural education aid endeavours into rural and regional Cambodia. His award visit will enable future collaborative work in Cambodia with Australian institutions and NGOs.